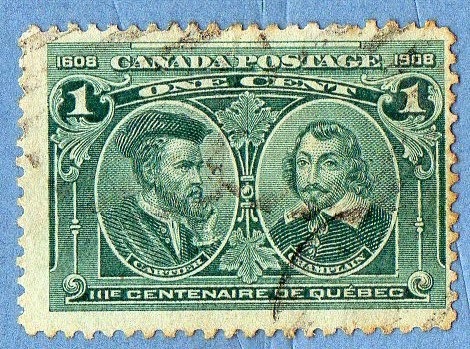 Today I will show some stamps from Canada and France..
a stamp with some rust spots and average condition.. it is a stamp from 1908 ; the stamp represents two personalities of great importance in Canada's history : Samuel De Champlain (French Explorer and Colonizer) and Jacques Cartier . 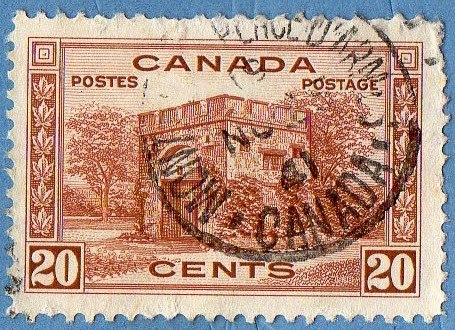 stamp from a 1938 series , representing Landscapes and historical buildings of Canadá..In this case , we have the Fort Garry Gate, Winnipeg.. I have already presented some more stamps of George VI that were from this same series .. The stamp (very beautiful..!) 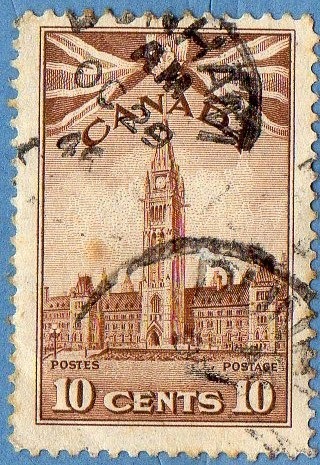 represents the Parliament Building with a British waving Flag above it , reminding us that this is a stamp of the famous "War Issue" from 1942/1943.. 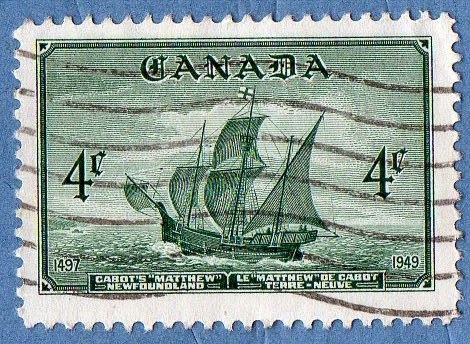 There was some indecision about showing or not the 1$ stamp.. as you can see it is severely 'damaged' by a post mark .. but in the end i decided to present it because he is also a new stamp in my collection..
[Left] stamp representing the ship "Matthew" known to be commanded by John Cabot, discover of NewFoundLand..
[Left] the picture represents the Fur drying process. 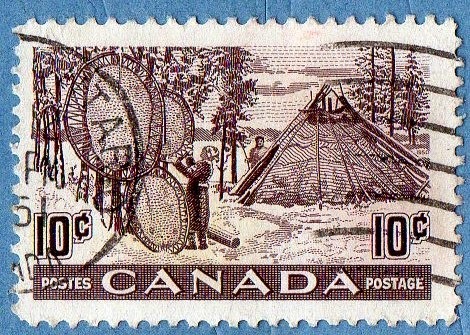 I just want to make a small comment about these Canadian Stamps...As you saw until now, I have shown 10 stamps in this post, from 1908 to 1951 and they all have the same perforation, no wmk's, no hidden secret's, and they are common , but I'm very glad to have them in my collection... Beautiful stamps make me Happy..! These are all stamps from the definitive series "Type Paix" from 1932/1941... actually, the series is issued in 6 different occasions..
As you can see Type I) has a normal small C and in the belt buckle You can see that two distinct lines are 'born'.. In the Type IIB)we have the same as in IIA) with another distinctive mark.. the inferior frame line is thicker below the space between the words 'Republique' and 'Française'..
the belt is again the main factor of differentiation between the two types.. 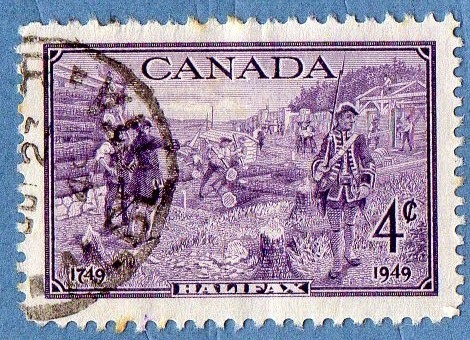 The 1932/1933 issue end's with the 1.75F stamp.. 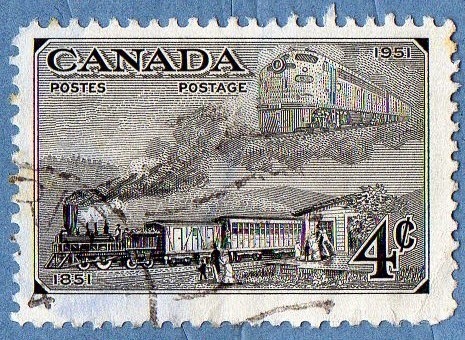 The others after 1.75F , with exception of the surcharged , are from the 1937/1939 issue. I will only present now the data from the original issue (that remains unaltered...) and all the Sc codes of the stamps presented in the order they appear in the images.. I really enjoy your interesting posts, but may I make a friendly suggestion? It is hard for me to read easily your words as they are always overlaid with the postmark image. Perhaps a slight change in the presentation would make it easier to read your fine blog posts? Regardless, I will continue to enjoy your posts!